Part Two: What Separates Us is Our Separated Bike Lanes In our last post we began to explore some of the ways that Copenhagen’s bike culture differs from the United State’s and how, if we are to “Copenhagenize” our bicycle culture—something that many, though not all, local cyclists desire—certain assumptions will need to be re-thought. One of the most difficult values to rectify in bringing Danish practice to the U.S. is that American cyclists must follow the same traffic laws as automobiles…in fact, US bicyclists have fought to establish and defend these laws for decades. For example, in Copenhagen bicyclists are required to use cycletracks wherever they exist, and citations are a real possibility for those who choose to ride in traffic with the cars and buses – to ride as U.S. laws allow. Left turns from most cycletracks require waiting two signal cycles – one to cross the street moving straight ahead, and then across the street to the left on the next signal. Moving to the left turn lane to make a turn on the next available signal is illegal. To their credit, Copenhagen’s civic authorities are keenly aware of the limitations and dangers associated with separated right-side bike facilities. The city has done a thorough job of adding bike boxes in advance of stop lines, introducing advance green cycles at major intersections – green for bikes first, then transit, and finally general traffic. More recently, the City has added flashing in-pavement lights extending through intersections to alert right turning motorists of the presence of riders in the cycle track. It’s impressive technology, to be sure – and necessary due to the vulnerabilities of bicyclists riding in that particular location on the right of way. This system works in Denmark for a number of reasons – most relating to Danish culture generally and not so much to “bike culture.” As with so many ancient cities in Europe, compact land use patterns are very conducive to cycling, and trip distances for the Danes are generally shorter than for their American counterparts. So, who needs to rush and blow through a light? The Danes will be the first to tell you that they put a huge cultural emphasis on civil obedience and not “standing out” – it’s all about we and not me in Danish society. Accordingly, adhering to rules and regulations that would send US cyclists to the ramparts are perhaps more easily accepted. So, we are fast, hard riding rugged American individualists and the Danes are subservient sheep? Not really. But their urban form, culture and topography certainly helps the odds for making easy cycling a useful means of getting around. Our cities (and perhaps Seattle in particular) require more effort from the bicyclist, which likely places a limit on the potential population of riders, and perhaps creates more of an identity of our cyclists as, well, cyclists. Does this mean there is no place for cycle tracks in Seattle? Our trail system (300 miles in King County alone) remains an enormously popular place for a broad spectrum of the public to cycle – for perceived safety, lack of hills and a generally pleasant environment. The Burke-Gilman and Sammamish River Trails (and so many others) generate new bicyclists in our region on a constant basis – these users seek the same characteristics in their rides as the Danes experience on their cycle-tracks. What made this trip so interesting and timely is that we have heard a growing chorus of local urbanists advocating a similar cycletrack approach for Seattle. US bicycle practice has been built (with strong support from local and national bicycling advocates) upon a foundation that the bicycle is a legal and accepted part of the on-street traffic mix. With that background, solutions mandating the use of separated parallel facilities has been discouraged for years. The Denmark model would seem to fly in the face of such a philosophy, and might stand to antagonize or alienate the very urban constituency that has fought for bike lanes, better access to transit, regional trails and other bicycle infrastructure. The Danes have emphasized cycle-tracks on their busiest arterials, and spent accordingly on the technological fixes in these locations. 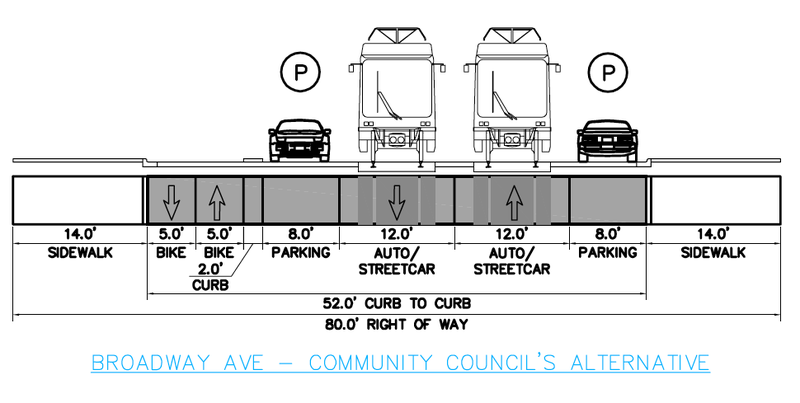 The Seattle Bicycle Master Plan identifies a number of similar streets here “for future study.” Many of these corridors (such as Westlake Ave between Fremont and South Lake Union) are flat arterials that wouldn’t involve any loss of parking spaces. In fact, the busier the street, the better the benefit of the trade-off between “vehicular freedom” and the desire to encourage new riders. If installed, new cycle tracks should focus on areas of high residential or employment density, good to excellent transit access, and, if possible, areas with a surplus of available on-street parking – as there will almost certainly be issues with merchants over the loss of what they often consider a critical resource. Whatever we do, we probably can (and certainly must) do a better job of preserving safety and mobility for pedestrians than is the case on many of Copenhagen’s cycle-track corridors. Oddly, it seems that the space for the tracks came equally from the vehicle lanes and sidewalks in a number of locations surprisingly close to downtown. That simply would be unacceptable in Seattle. Done properly, cycle-tracks can serve close-in urban neighborhoods (Eastlake, South Lake Union, portions of Capitol Hill) and areas served by high capacity transit (Rainier Valley, 12th Avenue E., the Bel-Red corridor on the Eastside) to encourage new bicyclists without stripping the rights of existing riders. There is still a place for bike lanes, sharrows and (eventually) bike boulevards, but, after Copenhagen, I am convinced that cycle tracks can and should be a tool in our kit for expanding the benefits of bicycling to a larger portion of the public.